Below Joe Kirkpatrick receives a check from Robert Prince on behalf of the Knights of Columbus. The Fieldcrest Board of Education was informed of the building issues at the Middle school at Wenona at their monthly meeting Monday night. Superintendent Dr. Dan Oakley said the school has shut down the older building and moved all students to the newer addition on the west side to protect the students from any potential structural failures during the building inspection and repair. Cost estimates are to be determined for repairing the north wall of the building, which is leaning. In addition, cost estimates for asbestos abatement and roof repair are to be determined. These cost estimates are part of a project to make the building safe again and is separate from the board's decision in determining a long term solution to the life-safety issues of the district's buildings. By moving the students to the newer addition, there is a shortage of lockers for students. Dr. Oakley said it could cost up to $25,000 to provide new lockers for the students. Dr.Oakley said the gas lines at Fieldcrest Primary in Minonk are in need of repair. 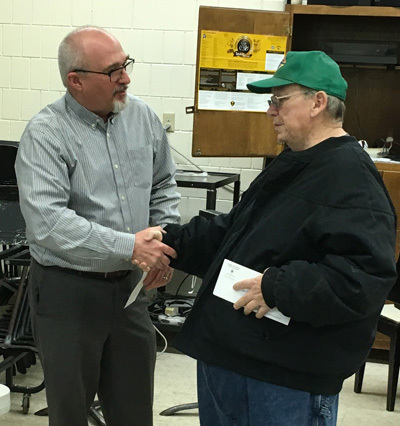 At the beginning of the meeting, Robert Prince presented a check for $1,120.97 to Board president Joe Kirkpatick on behalf of the local Knights of Columbus. The K of C has been presenting similar check amounts to the school district for a number of years and the accumulated total is over $42,000. Cindy Koudelka as MS Internal Coach. Dr. Oakley said because of the number of missed school days due to the bad weather, the school year will be extended until June 4th this year. Dr. Oakley said the election for the new school board members this year will be on Tuesday, April 2nd. The candidates who will be running for the school board are Jordan Meyer, Heather McKay, Scott Hillenburg and Joe Stasell. Fieldcrest Secondary Principal Jacob Wall said the SnackPack program at the school has been a tremendous success. He said over 1000 entrees have been distributed to qualified students so far this year. He said the program is funded by donations and volunteers through the area churches. He said he is looking for a way to extend the program into summer. At the end of the meeting board member Elizabeth Palm said she has heard there are some problems with the special education program and suggested the board should address that issue.